Jason Bushong pours his delicious wines in downtown Paso Robles. One of our readers recently sent me a note asking for recommendations of boutique wineries in Paso Robles. “My wife and I will be in Paso Robles in early February for three days to visit wineries, with a special interest in boutique ones. We are overwhelmed by the choice and would like to ask if you, or someone on your staff or you know, would have perhaps five to ten recommendations. Your suggestions would be very much appreciated. 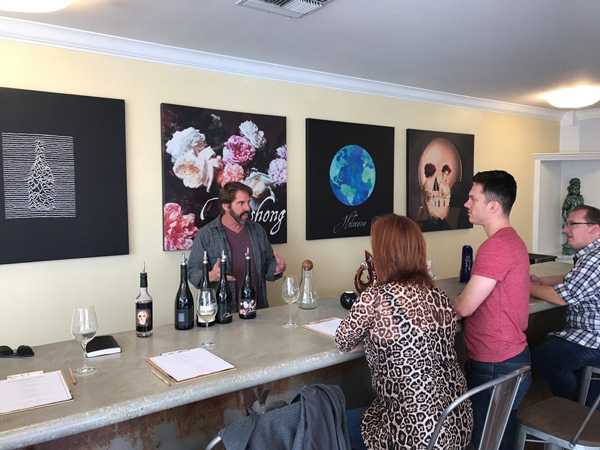 While I haven’t visited every winery in the Paso Robles AVA, I’ve have visited more than 100 wine tasting rooms, so thought I would share a few of my favorites for Bob’s next wine tasting adventure. My list runs a little longer than 10 because I enjoy so many of the smaller production wineries. This is a fun tasting room in downtown Paso Robles with an old Star Wars pinball machine and a large collection of vinyl records that you are welcome to play. Winemaker Jason Bushong frequently serves his stellar wines himself. He specializes in a modern-style of winemaking with an emphasis on Rhone-style wines. His label art is outstanding too. Guillaume Fabre is a young and adventurous winemaker who moved from Bordeaux, France to Paso Robles about 10 years ago. He interned for Stephan Asseo at L’Aventure Winery before breaking out on his own. He has a limited production of very elegant wines. He offers tastings by appointment only. I first met winemaker Russell From through his parents in King City more than a decade ago. He was a winemaker at Barrel 27 and doing a little side project of his own. Russell was on the cutting edge of making deep, dark, bold Rhone-style wines, like none I had ever tasted. His white wines were perfectly crisp and refreshing. He continues the tradition at his own tasting room near downtown. Jacob Toft has been producing small-batch, full-flavored wines for over 17 years. He studied under Stephan Asseo of L’Aventure for six years. He sources the best fruit he can find around the Central Coast. While you are there, take a walk around Tin City and taste some of the amazing wines these young winemakers are pouring. Winemaker Stephan Asseo began making wine in 1982, following his education at L’Ecole Oenologique de Macon, Burgundy, France. In the 1990s he settled in Paso Robles where he has become an icon among the new generation of winemakers. The spirit of L’Aventure is most evident in his “Paso Blends”, such as Optimus and Estate Cuvée. They are syrah, cabernet sauvignon, petit verdot blends. Tasting is by appointment only, click here to schedule your visit. Neeta and Kunal Mitta’s LXV was recently recognized as 7th Best Tasting Experience in America by USA Today. Visit their downtown Paso Robles tasting room and I think you will agree. 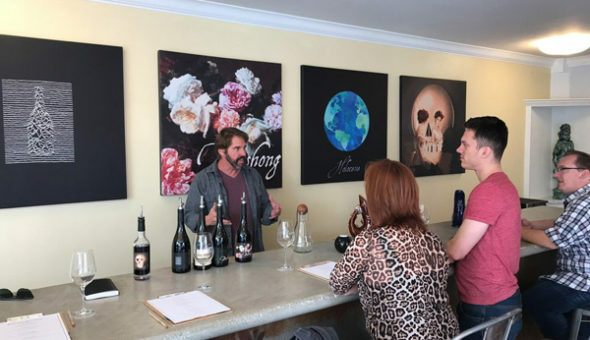 The boutique winery — which sources its limited production offerings from the Willow Creek District of Paso Robles — beat out high-caliber nominees from all over the country and impressed a knowledgeable panel of wine and travel experts. The highlight of their tasting experience is exquisite spice pairings. The tastings fold in exotic notes of rose, cardamom, jasmine, black truffle, and sarsaparilla, amongst others. One of the most impressive, award-winning, newer wineries I’ve come to love. If you like bold Rhone-style wines, come by and try Michael’s Black Tie Syrah. Randy and Cheryl Phillip are gracious and ever-present hosts serving up delicious wines. Like many of the boutique wineries in Paso Robles, all of Randy’s wines come from his estate grown grapes. There is large variety of wines on his tasting list: single varietals such as chardonnay, zinfandel, syrah, and cabernet sauvignon, and enticing blends such as the Heart & Sole, a blend of viognier/chardonnay, Achilles Weakness, a GSM plus petite syrah, the Kick-Off, a blend of zinfandel/petite syrah and others. His latest offering includes spirits. Try his Monkey Shine, Cinnamon Hooch, and Lemoncello. If you are looking for an out-of-this-world good time, pay a visit to my favorite wine philosopher Larry Gomez. Last time we visited he was playing the Wizard of Oz on a gigantic TV screen while playing Pink Floyd’s Dark Side of the Moon in sync. In October, the winery pays tribute to Dia De Los Muertos with an altar honoring the dead. The theme matches Larry’s label art. If you like baseball, ask to see his huge collection of San Francisco Giant’s banners in his production facility. Winemaker and farmer Dave King is one of my oldest friends in the local wine business. He was our first winery advertiser more than a decade ago. He purchased his eight-acre vineyard back in 1994. After a full 22-year career in the U.S. Navy and another eight years working as an engineer and program manager, Dave dusted off his Agriculture Engineering degree from Oregon State and took off on his “Walter Mitty” dream of running a small, 1900s-style, sustainably run vineyard. He excels in his specialty: traditional style zinfandels. If you are a boutique winemaker and I missed you on this list of the best boutique wineries in Paso Robles, send me an invitation to taste with you, or drop off a few bottles of wine at our office: Access Publishing, 806 9th Street, Ste. 2D, Paso Robles, CA 93446.